Almost all thought the Adidas Pro Model Vulc ADV looked stylish. Among the few reviews collated, nearly all confirmed that this sneaker felt comfortable. Many considered this model durable. A skater even revealed that this shoe still looked good after using it regularly for mob grip for more than three weeks. Others thought the sneaker was made of top-grade materials. Models made of leather were easy to clean, noted by some. Others also added that the leather looked and felt nice. It provided great support, one wearer disclosed. The Adidas Pro Model Vulc ADV is priced reasonably. A few said it provided excellent impact protection on the heel. The soles were durable and super grippy, according to some. Its high-cut construction offered improved stability, several disclosed. The thin cushioning on the toe area of the AdiPrene insole worked great for boardfeel. The laces on the Pro Model Vulc ADV ripped quickly, a few informed. Few noted that this shoe fits larger than expected. It felt stiff out of the box, a handful remarked. It also took a few days to break in, others added. The rubber insole’s thickness caused less accurate flicks for some skaters. It lacked breathability and made the feet sweat, several confirmed. This sneaker is hard to slip off, not many advised. Initially built for the hardwood, the Pro Model has been re-engineered to withstand the impact of grinds, lands and falls on halfpipes and ramps. Dubbed as the Adidas Pro Model Vulc ADV, this sneaker’s high-profile construction is favored for its stability and good looks. In spite of its lack of breathability, this shoe still has something to boast. With great board feel and reliable impact protection, it remains to be a good skate shoe option. Sneaker enthusiasts also favor this sneaker for its durability, retro aesthetics and affordable price tag. In the year 1965, German brand Adidas made their first ever basketball shoe which they called the Pro Model. Crafted with an all-leather upper, many pro hoop players made a switch to enjoy its durable, more stable construction. Back in those days, crushed toe boxes was a common issue experienced by players with their fave basketball shoes. Adidas, quick to solve the problem, revamped the Pro Model in 1969 by adding a shell toe cap. Now an iconic look, this update did not only enhance its durability, but it also elevated its aesthetics to a whole new level. Given its success, the brand saw it fit to make a low-cut version. Launched in the same year, the Superstar became one of their most influential and coveted creations. Although not as famed as its successor, the Pro Model has proven that it has made its mark in the sneaker culture. A familiar silhouette released in various colors, materials and shapes, somewhere along the way, this b-ball footwear went through another transformation and turned into a shoe welcomed by skaters. Tagged as the Adidas Pro Model Vulc ADV, this lifestyle sneaker/skate shoe looks very much like its predecessor but with a few small alterations. Made with a lightweight vulcanized sole and removable, drop-in AdiPRENE insole, expect this footwear to offer targeted impact cushioning without compromising boardfeel. Ollie, grind and flip while keeping your style in check with the high-top Adidas Pro Model Vulc ADV. Able to withstand the abuse thrashers inflict on their shoes, this model ensures to supply the stability, boardfeel and protection required to perform hair-raising tricks. Its vintage look and high profile design is also a head-turner. Skaters need not worry about their look since this shoe can be paired with various everyday clothing including cargo pants, hoodies, tees and baggy shorts. Hoop shoe-inspired while now built for skating, and made of either leather or suede, count on this sneaker to keep your feet in place while providing support and stability. Offered in men’s sizes, it commonly runs true to length. Sizes range from 4-14. Considered as the daddy of the Superstar, this casual shoe is recognized for its high-rise profile and its renowned rubber shell-toe cap. The latter gives this model its retro look. It also improves the shoe’s durability by reducing the risk of a blowout. 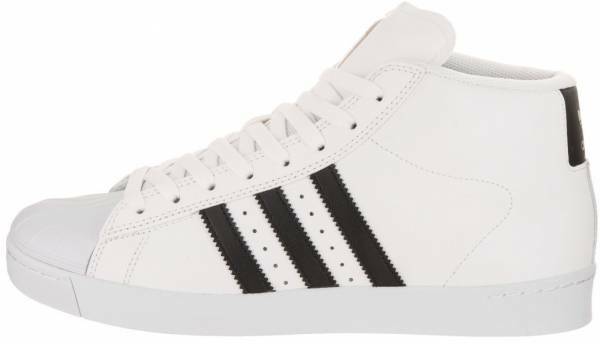 The design is completed with the addition of the synthetic leather three stripes on both sides of the shoe as well as the heel patch. The upper’s material varies depending on the colorway. Some are donned in leather. Others are dressed in suede. Its vulcanized rubber sole features a multi-directional Vector Traction. This traction pattern enhances board control and grip. In-shoe feel is improved with the help of the breathable mesh lining and thickly padded collar. The collar also adds protection. Branding is displayed on the Pro Model Vulc ADV’s tongue and heel tab. The fit is improved with the addition of the tradition lacing system. This comes with flat tonal laces.